*Update: Big news is that Mary Cullen will take on Linda Byrne in the senior women’s race at the National Interclubs on Sunday and that Alistair Cragg leads a strong Clonliffe team. Cragg at his best has always radiated quality and stays in close touch with high performance manager Kevin Ankrom, whose stated ambition is to win medals at international competitions. The Clonliffe squad also includes Mark Kenneally, who is recovering from injury and finished 12th at the recent Armagh International 5km, and US-based David Flynn. Clonliffe are clearly pulling out the big guns and bringing home all their overseas members – Sarah McCormack is entered for the women’s race. After the clean thrills of the indoors last weekend, it’s back to the fundamentals for Sunday’s Woodie’s DIY Irish Interclubs Cross-Country Championships in Tullamore. Eddie McGinley of Annadale Striders was a surprise winner last year, with the Clonliffe trio of Sergiu Ciobanu, Gary O’Hanlon and Brian McMahon taking the next three places and ensuring team victory for the Dublin club. More recently, Joe Sweeney of DSD won the intercounty championships on a muddy and strength-sapping track at Ratoath last November. Taking the minor placings were Michael Mulhare of Portlaoise AC , Sean Hehir of Rathfarnham, Kilkenny’s Brian Maher and Clonliffe’s Stephen Scullion. Despite their commitment to the Marathon Mission, both Sean Hehir and Barry Minnock will run on Sunday in a brave attempt to put Rathfarnham among the medals. Another club likely to be in contention is Raheny Shamrock, led by the in-form Simon Ryan. Linda Byrne of DSD will defend the women’s title she won last year at Santry, buoyed by the news that Athletics Ireland will indeed send a team to the World Cross-Country Championships. Others with a chance of a medal include Lizzie Lee of Leevale, fresh from the 3000m indoor victory last week, and a Raheny squad including Fiona Roche and Elish Kelly. Last year, DSD beat North Belfast Harriers for team gold and this year, the Belfast club could go one better, with a formidable squad including Breege Connolly and Gladys Ganiel O’Neill. Of the junior women, Siofra Cleirigh Buttner of DSD is determined to make up for her defeat last year at the hands of Swiss-based Sarah Mary Collins. She comes fresh from a determined performance at the National Indoors, where she finished fourth in the 800m. DSD are strong favourites to take team gold. In the men’s junior 6km, likely contenders include Clonmel’s Sean Tobin, Aaron Hanlon of Clonliffe and DSD’s Killian Mooney. With defending champions Raheny Shamrock not quite as strong this year, Clonliffe and DSD will give them a good battle for the team honours. * Racing at the Charleville Estate in Tullamore begins at 1pm with the junior girls’ 4km. Entry is already open for this year’s Rás UCD 5km on Saturday April 6 (12 noon). All entry fees go to UCD Volunteers Overseas (UCDVO) projects which sees around 100 studnets spending their summers working in developing countries. Last year, almost 600 participants in the Ras helped raise over €7,000 for UCDVO. Online registration is only €10 for students and €15 for members of the public and offers exceptional value with t-shirts and goodie bags for all who pre-enter. See www.ucd.ie/rasucd or www.runireland.com/active/enter-online. At At Ras na hEireann in Drogheda, Americans visitors, led by Brendan Gregg and Ethan Shaw, took the top five places in the men’s race, with Alan Danaher of Rathfarnham WSAF in fifth place the first of the locals. In the women’s open race, Kate O’Neill of MSB finished finished second behind American visitor Mary Kate Champagne. A few days earlier, at the Armagh International Road Races, Mary Cullen from Sligo continued to impress when she set a new course record of 9:7.88 for the women’s 3km. DSD’s Ava Hutchinson was second. In a closely fought men’s 5km race, American visitor Ethan Shaw came home first ahead of Richard Weir from Derby and Annadale’s Paul Pollock. Ailish Malone and Cillian O’Leary were the winners at the Garda BHAA Cross-Country in Dublin’s Phoenix Park. Malone beat Laura Shaughnessy of UCD in the women’s 2-mile, while in the men’s 4-mile, O’Leary go the better of Sam Mealy and Bernard Roe. Next up on the BHAA calendar is Saturday’s Dublin Airport Cross-Country. Marathon Mission member Barry Minnock of Rathfarnham WSAF won the Donadea 50km with a time of 3 hrs 5 mins 2 secs, with Mayo ultra man John Byrne running strongly for second place in 3:07.40. 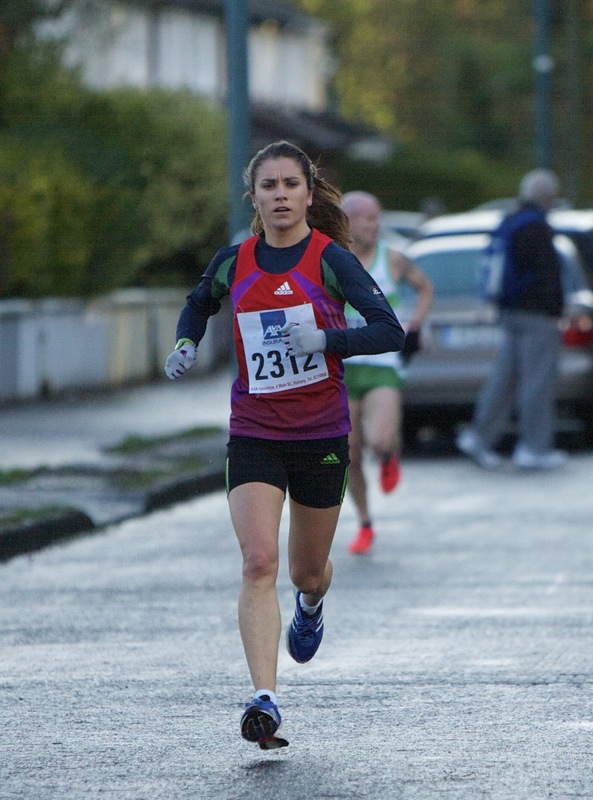 At the Mount Juliet 10km, Barbara Sanchez of Raheny Shamrock was fourth overall and first woman; Tom Hogan (SBR) won the half marathon.